The Union Government on 5 September 2015 announced One Rank One Pension (OROP) scheme for ex-servicemen. The scheme was pending for nearly four decades. Though the scheme was announced in February 2014, it was not implemented till date as the modalities of the scheme were not finalized. 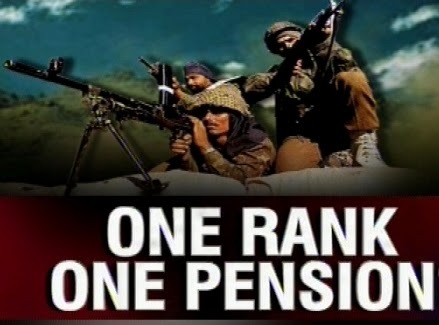 In simple terms, OROP implies that uniform pension be paid to the armed forces personnel retiring in the same rank with the same length of service, regardless of their date of retirement. At present, ex-servicemen receive differential pensions as it is calculated on the basis of their salary at the time of their retirement. Differential payments occur as the salaries of personnel are frequently revised on the basis of pay commission’s recommendations. For example, personnel who retired in 1990 receive fewer pensions compared to their juniors who retired in 2006 though they retired at the same rank with same length of service. • Pension will be re-fixed for all pensioners retiring in the same rank and with the same length of service as the average of minimum and maximum pension in 2013. • The benefit will be given with effect from 1 July 2014 to the ex-service men of all the three forces. • Those drawing pensions above the average will be protected. • In future, the pension would be re-fixed every 5 years. • Arrears will be paid in four half-yearly installments. • All widows, including war widows, will be paid arrears in one installment. • Personnel who voluntarily retire will not be covered under the scheme. • The estimated cost to the exchequer would be 8000 to 10000 crore at present, and will increase further in future. To resolve further issues related to the implementation of the scheme especially those of inter-service issues of three forces, the government also announced to form a one member judicial committee that will give its report in six months.